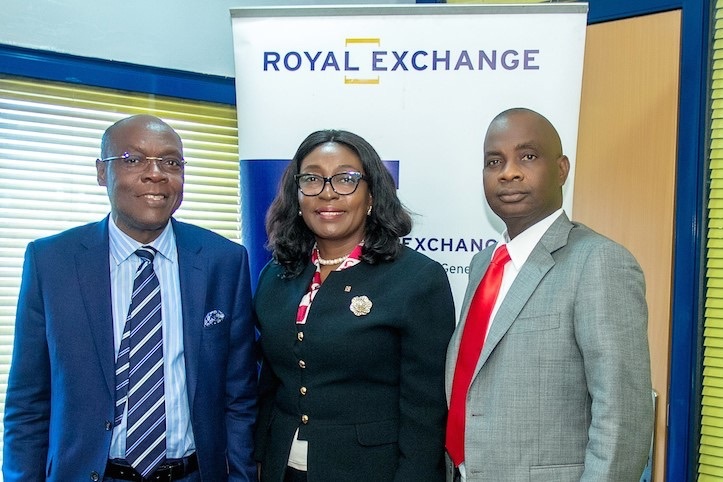 From left: Managing Director, Royal Exchange General Insurance Company, Benjamin Agili; President, Professional Insurance Ladies Association, Mrs. Ose Oluyanwo and Managing Director, Royal Exchange Prudential Life Assurance, Wale Banmore at the visit in Lagos. The Professional Insurance Ladies Association (PILA), an umbrella body for all Chartered Ladies in Insurance, has paid a courtesy visit to Royal Exchange Plc, to seek support for its various activities planned for the year. A statement by the Head of Corporate Communications, Royal Exchange Insurance Plc, Wilson Okoh-Esene, noted that the the Executive Members of PILA met with the Managing Directors of Royal Exchange Prudential Life Assurance, Wale Banmore and Royal Exchange General Insurance Company, Benjamin Agili. According to him, the PILA team was led by its President, Ose Oluyanwo and were received by the management team of both underwriting firms. PILA is the first female professional body to be established in Nigeria in 1973; and aims to ensure gender mainstreaming beyond the shores of insurance in Nigeria through the forthrightness.